- wire (for legs and arms). 1 row: dial pink thread 2 v. and close the ring. Knit 6 tbsp. b / n [= 6 tbsp. b / n] Next, knit in a circle. In this series, you must begin to knit hearts on each side (see picture in photo). Tip: Hearts are much easier to tie separately, and then sew to the body. Take as a basis the diagram in Figure 2, or knit hearts according to the photo above. Figure 2. Heart knitting pattern. Please note that the semicircles of the heart according to scheme 1 are knitted with the tearing of the thread: first you need to finish one semicircle and cut the thread, and then knit the next one. 19 row: go for knitting with red thread and knit without increases. In the face area it is necessary to tie out the “parting” (see the photo), for this purpose 9 art. b / n knit pink thread [= 54 tbsp. b / n]. 25 row: * skip 1 tbsp. b / n the previous row, knit 3 tbsp. b / n *. Repeat * 6 times [= 18 Art. b / n]. Stuff torso filler. 27 row: * skip 1 tbsp. b / n the previous row, knit 1 tbsp. b / n *. Repeat * 6 times [= 6 tbsp. b / n]. Stuff torso filler. 28 row: * skip 1 tbsp. b / n the previous row, knit 1 tbsp. b / n *. Repeat * 3 times [= 3 tbsp. b / n]. Tie the remaining 3 loops together, tear the thread. 1 row: dial a raspberry thread 2 v. and close the ring. Knit 6 tbsp. b / n [= 6 tbsp. b / n] Next, knit in a circle. Cut a wire the size of 7-8 cm, bend one edge at it, wrap a small amount of 3-4 cm of filler, pull the filler with a thread, insert the wire with a curved end into the leg. Unclamp the edge of the wire to stick into the bottom of the torso and sew to it. Insert the wire wrapped with padding polyester into the handle (see the description of the legs). 1 row: dial with a pink thread 5 cf, knit st b / n into the second loop from the hook, 3 st b / n, 5 st b / n in one loop, 3 st b / n, 4 st.b / n in the initial loop [= 16 st. b / n]. Cut the thread. 5 row: knit without increments [= 18 tbsp. b / n]. Cut the thread. 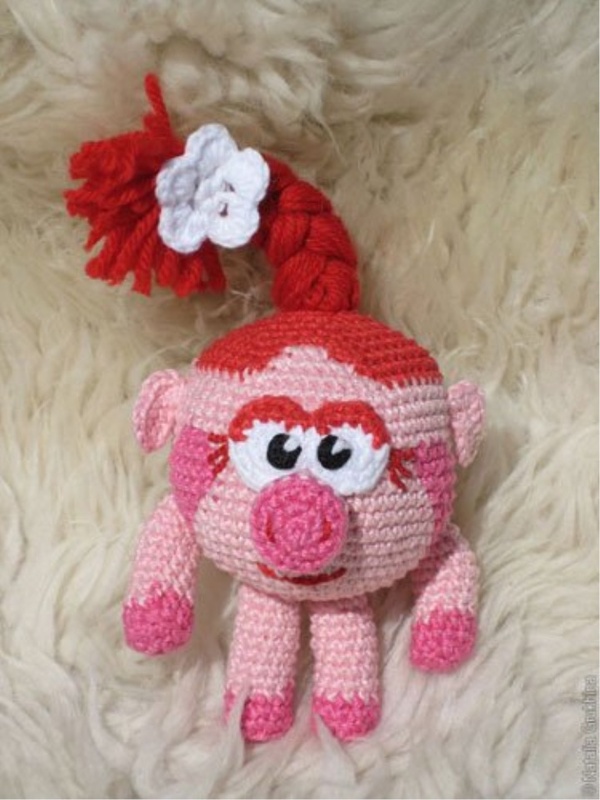 Piglet filled with padding polyester and embroidered with red thread nostrils. 1 row: dial white thread 2 v. and close the ring. Knit 6 tbsp. b / n [= 6 tbsp. b / n] Next, knit in a circle. 3 row: 2 tbsp. b / n in the gap between the columns of the previous row, 1 tbsp. b / n, 2 tbsp. b / n between the posts of the previous row. Go for knitting with red thread, knit 1 tbsp. b / n, 2 tbsp. b / n in the gap between the columns of the previous row, 1 tbsp. b / n, 2 tbsp. b / n in the gap between the columns of the previous row, 1 tbsp. b / n Go back to knitting with white thread and knit to the end of the row in the same sequence [= 18 cent. b / n]. Cut the thread. 1 row: type in white thread 4 vs and close the ring. * 1 st b / n, 5 v.p. *. Repeat * 5 times [= 5 arches from air loops]. 2 row: * knit in each arch 1 tbsp. b / n, 1 pillar with / n, 1 st s / n, 1 tbsp. c 2 / n, 1 tbsp. c 2 / n, 1 st s / n, 1 semi-column c / n, 1 tbsp. b / n *. Repeat * 5 times. Cut the thread. 3. At the top, fasten the hair from red wool yarn and braid them in a pigtail. Sew to pigtail flower. 4. Make a face out of the picture.